Make no mistake about it, we Georgians love hummingbirds. Each year folks from Woodbine to West Point and Bainbridge to Helen and countless cities and towns in between spend hours enjoying the beauty and aerial acrobatics of the birds that John James Audubon called "glittering fragments of the rainbow." Remarkably, although these tiny dynamos enjoy immense popularity, many of us are not doing all we could to enhance the habitat the birds need. Realizing this, a few years ago the Garden Club of Georgia and Georgia DNR’s Nongame Conservation Section launched an ambitious initiative named the Hummingbird Haven Program. The goal of this effort is to encourage homeowners to transform their yards into veritable hummingbird havens – places where hummingbirds can find feeders and an abundance of nectar-bearing plants. One thing that I have learned studying hummingbirds for more than a quarter century is that invariably the homeowners that attract the most hummingbirds to their yards are those that combine offering these tiny masters of the sky both feeders and nectar-rich plants. The Hummingbird Haven initiative is part of the more than award-winning Community Wildlife Project. This program, more than 20 years old, has promoted the concept that wildlife are a very important part of the communities in which we live. As such, with a little planning and effort, we can provide our wildlife neighbors with the food, water and cover they need to prosper while at the same enhancing the quality of our lives and the beauty of our communities. Over the years, thousands of Community Wildlife Project certifications have been awarded for areas large and small. They have ranged from backyards, neighborhoods and assisted living facilities to cities, towns and even a county. These efforts have benefitted a wide variety of native plant, birds, mammals, butterflies and other insects, plus reptiles, amphibians and other wildlife species. As the name suggests, the Hummingbird Haven Program is designed to encourage Georgians to provide hummingbirds with top-notch habitat throughout the year. While the ruby-throated hummingbird is the only species of hummingbird that nests in the Peach State, 11 other species have been reported here. The list includes rufous, Allen's, Anna's, broad-billed, broad-tailed, black-chinned, magnificent, calliope, green-breasted mango, buff-bellied and green violet-ear. Most of these birds are only seen here during the winter, which has been called Georgia’s second hummingbird season. The focus of the program is offering dependable sources of food for the ruby-throated hummingbird. However, since rare western migrants regularly visit our state in winter, hummingbird enthusiasts are also urged to provide food and cover for them, too. The plants that serve as the source of this natural food include a long list of trees, shrubs, perennials, biennials, annuals and vines. These natural nectar sources can be supplemented with feeders. Not all flowering plants produce an abundance of nectar. For example, although popular plants such as daffodils, forsythia, crepe myrtle and Bradford pear are beautiful, they offer hummingbirds and other nectar-feeders little food. (Also worth noting, Bradford pear is listed as an invasive species.) As such, the initiative encourages homeowners to plant excellent hummingbird nectar plants alongside their nectar-slim garden favorites. Homeowners are urged to use caution when trying to decide what to plant in their yards. It is recommended that native plants be used as much as possible. Certain ornamentals are great sources of nectar. However, the last thing you want to do is to introduce an ornamental that can become a plant pest. For example, while leatherleaf mahonia is visited by rufous hummingbirds wintering in the state, the plant can spread beyond our yards and compete with native plants. Since hummingbirds are found in Georgia the entire year, the Garden Club of Georgia and the Nongame Conservation Section are asking folks to plant a variety of plants that provide nectar throughout as much of the year as possible. Believe it or not, there are actually nectar plants blooming in Georgia in the winter and early spring. As for hummingbird feeders, homeowners are encouraged to maintain at least one feeder in their yards 12 months of the year. These feeders insure that the birds will have access to a dependable source of food when few if any flowers are blooming nearby. Feeders also allow hummingbirds that are preparing to migrate to consume a large amount of food in a short period of time with little effort. They also provide migrating hummingbirds with food-rich resting and feeding stops along their journey. When migration is over, feeders offer wintering hummingbirds much-needed food during the time of the year when natural nectar is scarcest. The need for these refueling stations has never been greater. Historically, migrating rubythroats could easily find naturally occurring nectar at many sites. According to some hummingbird experts, patches of that great nectar plant, jewelweed, were particularly important to the birds. Some experts say it’s no coincidence that the peak of the ruby-throated hummingbird's fall migration closely coincides with the peak blooming period of jewelweed. However, with each passing year, more and more critical stopover areas are disappearing. Consequently, it is becoming increasingly more difficult for these long-distance migrants to store enough fuel, stored as fat, to make their arduous journey to their wintering grounds and back again. To put this in perspective, it has been estimated that a migrating ruby-throated hummingbird needs to carry about 2.1 grams of fuel, or 3/40 of an ounce, to cross some 500 miles of open water – the shortest distance – across the Gulf of Mexico between the southeastern U.S. Coast and southern Mexico and Central America. A network of backyards full of nectar-bearing flowers and feeders can help these birds. In our yards, without having to expend a tremendous amount of energy, they can quickly find the food needed for their migration. By the same token, when the birds return to Georgia, they are not in the best physical condition. For example, last month I captured an adult male rubythroat in southwest Georgia that had obviously recently arrived in the state. This bird weighed only 2.8 grams – a weight typical of a young bird fresh out of the nest, not an adult rubythroat. This bird was not an exception. Yet, unfortunately, when rubythroats arrive back in the Peach State, they are often greeted by a paucity of nectar plants. Consequently, they supplement the meager supply of nectar by feeding on small insects and the sap that wells up in tiny holes drilled in a variety of hardwood trees by the yellow-bellied sapsucker. Feeders containing sugar water can be important to these tired migrants. 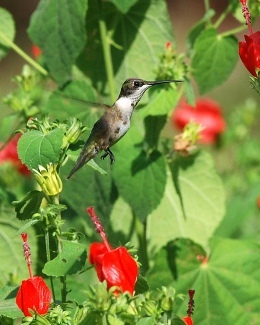 If you would like to see if your yard qualifies as a Hummingbird Haven, or want to transform your yard into one, visit the Community Wildlife Project or http://gardenclub.uga.edu/cwp.html. Download and submit an application form. That application will be carefully evaluated. If you qualify, you will receive a certificate that acknowledges all you are doing for hummingbirds. In addition, you will be eligible to buy an attractive metal Community Wildlife Project sign through The Garden Club of Georgia. If your application is rejected, you will be advised what you need to do to earn certification. I hope that you will decide to spruce up your yard for hummingbirds. If you do, you will quickly discover the multiple benefits of those efforts. You will beautify the landscape around your home, increase your enjoyment derived from observing the birds and also benefit a host of other nectar feeders such as butterflies and native bees. Don't be surprised if you find yourself wondering who benefits most – you or the hummingbirds! If you have any questions regarding the program or hummingbirds in general, just let me know.